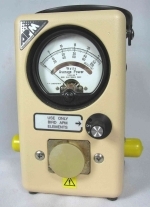 Average-Reading Portable Wattmeter. Designed especially for RF power measurement in PCS, cellular, ESMR, paging and similar communication systems. Equally effective for measuring RF power in conventional analog systems. Uses APM-series plug-in elements to cover a wide range of frequency and power levels. Simple Thruline style operation for instant forward or reflected power readings. Interchangeable QC connectors for fast hook-up. Used in excellent condition. Much improved accuracy over the Model 43 type meters the APM-16 accuracy is +/- 1% FS and +/- 4% reading. Requires APM-16 type elements.